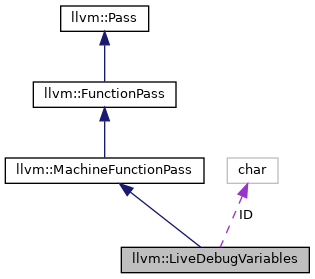 Definition at line 32 of file LiveDebugVariables.h. Definition at line 92 of file LiveDebugVariables.cpp. Definition at line 1007 of file LiveDebugVariables.cpp. References llvm::LiveRange::advanceTo(), llvm::IntervalMap< KeyT, ValT, N, Traits >::const_iterator::advanceTo(), assert(), llvm::LiveRange::begin(), llvm::LiveRange::beginIndex(), DbgValueLocation::changeLocNo(), llvm::MachineOperand::CreateReg(), llvm::dbgs(), llvm::LiveRange::empty(), llvm::LiveRange::end(), llvm::IntervalMap< KeyT, ValT, N, Traits >::iterator::erase(), llvm::IntervalMap< KeyT, ValT, N, Traits >::const_iterator::find(), llvm::LiveIntervals::getInterval(), llvm::MachineOperand::getReg(), llvm::IntervalMap< KeyT, ValT, N, Traits >::const_iterator::goToBegin(), llvm::IntervalMap< KeyT, ValT, N, Traits >::iterator::insert(), llvm::MachineOperand::isReg(), DbgValueLocation::isUndef(), LLVM_DEBUG, DbgValueLocation::locNo(), llvm::Pass::print(), llvm::LiveInterval::reg, llvm::IntervalMap< KeyT, ValT, N, Traits >::const_iterator::setMap(), llvm::IntervalMap< KeyT, ValT, N, Traits >::iterator::setStartUnchecked(), llvm::IntervalMap< KeyT, ValT, N, Traits >::iterator::setStopUnchecked(), llvm::MachineOperand::setSubReg(), llvm::IntervalMap< KeyT, ValT, N, Traits >::iterator::setValue(), llvm::IntervalMap< KeyT, ValT, N, Traits >::iterator::setValueUnchecked(), llvm::ArrayRef< T >::size(), splitRegister(), llvm::IntervalMap< KeyT, ValT, N, Traits >::const_iterator::start(), llvm::IntervalMap< KeyT, ValT, N, Traits >::const_iterator::stop(), UndefLocNo, llvm::IntervalMap< KeyT, ValT, N, Traits >::const_iterator::valid(), and llvm::IntervalMap< KeyT, ValT, N, Traits >::const_iterator::value(). Definition at line 1434 of file LiveDebugVariables.cpp. emitDebugValues - Emit new DBG_VALUE instructions reflecting the changes that happened during register allocation. VRM Rename virtual registers according to map. Definition at line 1424 of file LiveDebugVariables.cpp. splitRegister - Move any user variables in OldReg to the live ranges in NewRegs where they are live. Mark the values as unavailable where no new register is live. Definition at line 1152 of file LiveDebugVariables.cpp. References llvm::MapVector< KeyT, ValueT, MapType, VectorType >::begin(), DbgValueLocation::changeLocNo(), llvm::DenseMapBase< DerivedT, KeyT, ValueT, KeyInfoT, BucketT >::clear(), llvm::MachineOperand::CreateFI(), E, llvm::VirtRegMap::getPhys(), llvm::MachineOperand::getReg(), llvm::MachineRegisterInfo::getRegClass(), llvm::MachineFunction::getRegInfo(), llvm::VirtRegMap::getStackSlot(), llvm::TargetInstrInfo::getStackSlotRange(), llvm::MachineOperand::getSubReg(), I, llvm::MapVector< KeyT, ValueT, MapType, VectorType >::insert(), llvm::VirtRegMap::isAssignedReg(), llvm::TargetRegisterInfo::isPhysicalRegister(), llvm::MachineOperand::isReg(), DbgValueLocation::isUndef(), llvm::TargetRegisterInfo::isVirtualRegister(), DbgValueLocation::locNo(), llvm::VirtRegMap::NO_STACK_SLOT, llvm::MachineOperand::setReg(), llvm::MachineOperand::setSubReg(), llvm::MachineOperand::substPhysReg(), Success, TII, and TRI. Referenced by getNumAllocatableRegsForConstraints(), and ~LiveDebugVariables(). Definition at line 36 of file LiveDebugVariables.h.